If you didn't have the time in reading my lengthy blog post about the Excavator-Jack (I'm telling you though, it's worth a read! 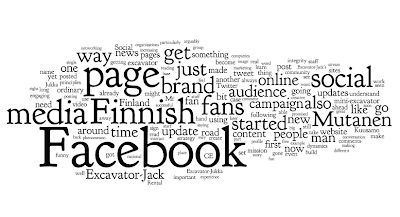 ), this summer's big social media phenomenon from the Finnish land of thousand lakes and islands, you can get the gist of the story from the 'word cloud' below. Brought to you by Wordle, a handy tool that lets you play around and create your own word cloud from your chosen text. Back in April a particularly quirky Facebook page caught my eye. 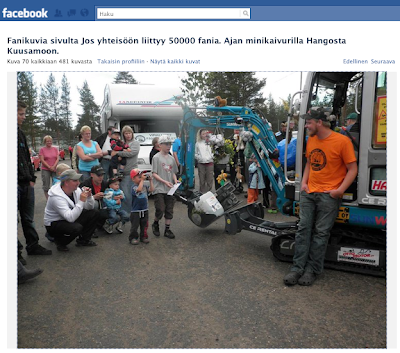 Created as a joke by an ordinary Finnish man with an ordinary Finnish name, Jukka Mutanen promised to drive a mini-excavator from his home in Hanko, the southernmost town in Finland, all the way to Kuusamo in the Finnish Lapland "...if 50 000 people sign up for this online community". Here's the remarkable social media phenomenon case study that unfolded. By all means feel free to have a good chuckle, however, there are some serious lessons we can learn from the Excavator-Jack on how to develop a social media campaign with a real following (and become a national hero in the process). 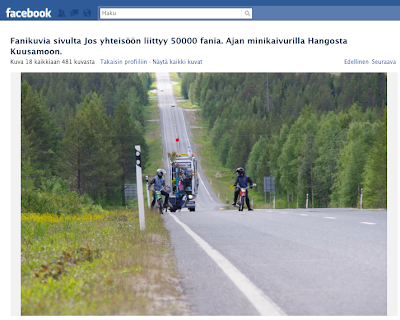 The Facebook page created by Jukka Mutanen on the 15th of April may have started off as a joke but it soon caught the imaginations of the rest of the 1,793,300 Finns on Facebook (41.2% of the Finnish online population as of 1.7.2010). Before Mr. Mutanen knew it, his page had gone viral and fans were pouring from all corners of the Finnish wilderness. 5000 fans joined in the first 48 hours. 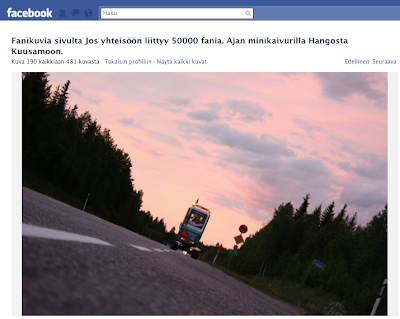 After being live for three days already 15 000 fans had found their way over — and the momentum was only starting to build. By the fourth day, 19th of April, a whopping 30 000 fans had clicked the 'like' button on the page to take part in the big debate on whether or not Mr. Mutanen would actually go ahead and do what he said he would do (which is the definition given for integrity by a large majority of FTSE100 companies by the way). By now, news of the ordinary Finnish bloke's engaging Facebook page had gone mainstream. The popular media outlet Iltasanomat picked up the story which only resulted in more fans joining the ranks. The magic 50 000 mark was broken soon after and the numbers kept increasing by the minute. The man and his pledge was now the water-cooler-conversation around every office in Finland. 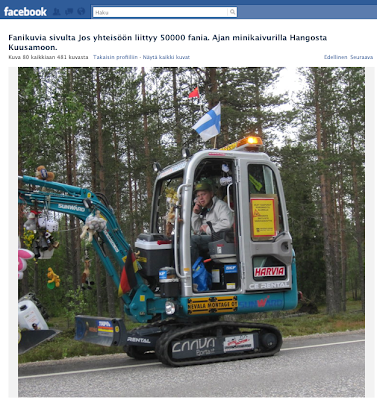 His newly found fans were now anxiously waiting whether he would fulfill his part of the deal and indeed take his mini-excavator on the 942 km ride through the Finnish wilderness. The man himself was assuring his increasing 'fellowship of the excavator' of his commitment of remaining true to his self-proclaimed mission albeit being 'somewhat surprised' of the huge publicity he had been able to attract in such a short time. Showing willingness to engage his captive audience in decision-making from the very beginning, the by-now-celebrity Mr. Mutanen was already crowd-sourcing for ideas for possible routes for his expedition. Below post is in Finnish, but you get the idea. Mr. Mutanen was left with two choices: either back away and delete the Facebook page (and move to Barbados with a tail between his legs) or display high integrity and do as he promised. As a man of his word, he chose the latter option posting his picture on Facebook to assure his fans that he was fully committed to the challenge. By now the fans' favorite Mr. Mutanen had become known as the 'Excavator-Jack' (in Finnish: 'minikaivuri-Jukka') in the Finnish media and was busy making plans for his challenging adventure. And challenging it was going to be. According to Google Maps, his chosen route from Hanko to Kuusamo via Oulu was going to be 942 km long and it would take around 12 hours and 35 minutes in total, non-stop — by a car! The Excavator-Jack, as he branded himself on his English website, had promised to hit the road with a mini-excavator with a maximum speed of no more than 4 km per hour. Unfortunately Google Maps is yet to have the capability of measuring the duration of travel by a mini-excavator, but you can do the math that it was going to take a good few more hours than that. 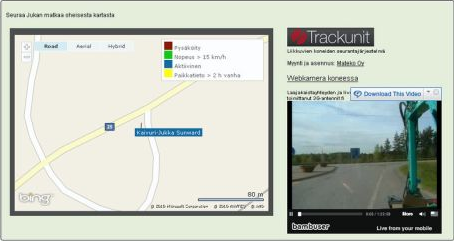 According to Excavator-Jukka's own estimate he'd be on the road for around three weeks before reaching his destination. As interest around the man and his excavator was building and the news had gone viral, other related Facebook pages started emerging. 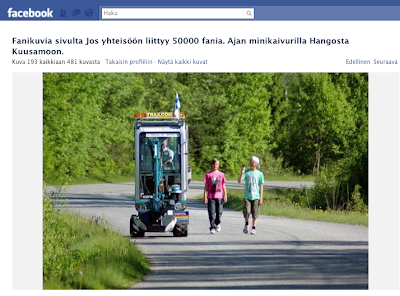 Founder of one group said he would bike along the Excavator-Jukka 'if 100 000 people signed up'. 'Only' 40 000 did. 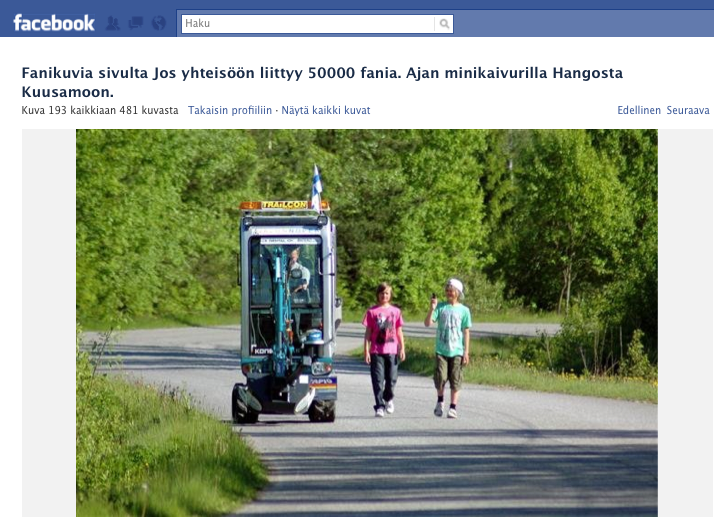 A couple girls set up another group saying that they would roller-blade along the excavator 'if 50 000 people sign up'. There were others too and only signaled the exponentially growing interest around the Excavator-Jack. The blogosphere was busy pumping out more content and all the news media outlets were closely monitoring the most unusual developments taking place in the Finnish tranquility. Car drivers, on the other hand, were worrying about road safety and traffic jams, while the police assured everything would go smoothly. The Finnish importer of the mini-excavator CE Rental, understanding how the unexpected buzz building around the Excavator-Jukka and his admittedly freaky stunt could turn into something concrete, went on to announce: "Sunward and it’s Finnish importer, CE Rental, have sponsored Jukka’s attempt by providing him with the excavator and it’s maintenance." So proudly read the statement on the purpose built website also donated and hosted by CE Rental. 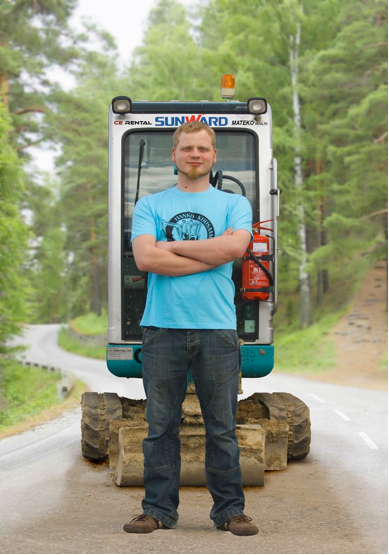 A big banner ad soon started greeting new visitors to CE Rental's homepage with a link to Excavator-Jukka's microsite. Kudos to the marketing team at CE Rental for seizing the opportunity and sponsoring Jukka. Not only that, but the company also made a pledge of donating money to charity: "CE Rental also mathes this sponsorship by donating an equal amount of money to charity." News of Excavator-Jukka's mission also reached Sunward, the excavator's manufacturer in China, where Qinghua He, the head honcho quickly announced that he would be in Kuusamo to greet Excavator-Jukka upon his expected arrival on the 24th of June, just in the time for the Finnish mid-summer festival. Sunward also declared that they would have the attempt submitted to Guinness World Records. It probably wasn't going to hurt their plans of growing their 25 per cent market share in Finland. The somewhat unusual brand awareness campaign made the news on other industry, resale and construction information sites. Other companies and organizations too started jumping on the excavatorwagon. Among these was WorldVision Finland, who recruited Mutanen to promote their campaign on the scarcity of water in developing countries. Probably feeling encouraged by the by-now 83 000 -strong entourage cheering him on Facebook, Jukka Mutanen started his mission on the 1st of June. 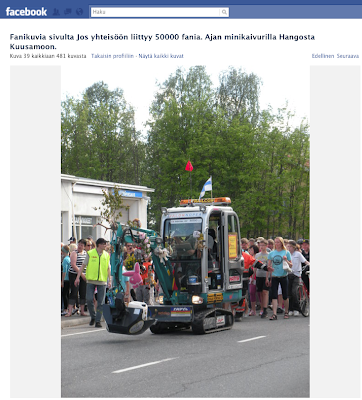 The Finnish national news outlet YLE reported on the high-tech Excavator-Jack's sending off ceremony from Hanko. The man on the mission was connected to his ever increasing online community with his wireless network, excavator-cam and iMac which enabled him broadcasting live image from the road on via his website. His audience could simultaneously enjoy listening to Jukka's witty commentatory of the events unfolding. Viewers could also chat with other fans while watching the live stream conveniently on the very same video player. Thanks to the map showing the exact coordinates of the Excavator-man on his website, he soon started attracting large audiences where ever he was crawling. Simultaneously a never-ending stream of user-generated content started feeding through his Facebook page in the form of funny commentatory and images from random passers by who had spotted the Jack on the road. Here are some selected images out of the hundreds of pictures posted on the Facebook page. All credits are due to fans of his Facebook page. Fans hovering around their hero during a pit-stop. Spot 'Water bucket number 5' of World Vision's water campaign in the digger of the mini-excavator. Fans of the campaign could track the bucket on the World Vision campaign page on Facebook. Some more innovative fan memorabilia. Yet another Facebook page and a website with an on-line shopping basket was set up to match the growing demand for the appropriate by-products. A peek inside the hig-tech excavator-pit. Stonela, a Finnish band, made a catchy tune about the Excavator-Jack and probably boosted their popularity in the process. The lyrics are brilliant! Watch and listen to the video below and enjoy the Finnish landscape. I can do some translating upon request. 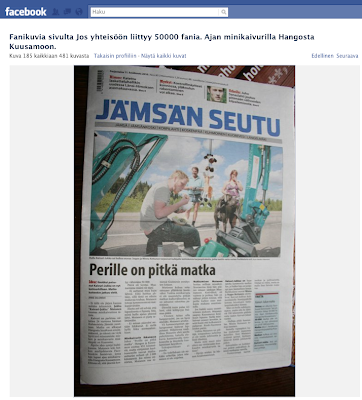 Different local newspapers competed of coming up with the most creative headlines as the Excavator-Jack passed by. 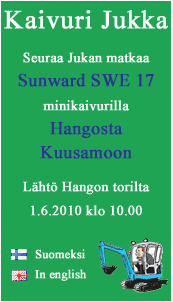 'Long road ahead' read the cover story in one newspaper called Jämsän seutu. 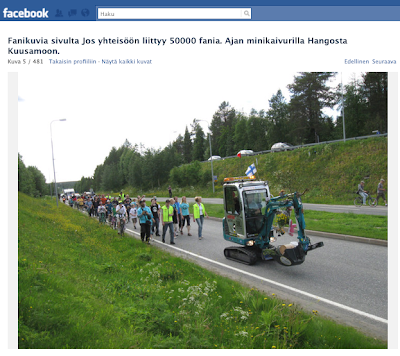 MTV3's reporter conducted a particularly funny interview on the fly catching the Excavator-Jack, by foot, and then overtaking him, by foot, to edit his interview 'in time for the evening news'. Through the Finnish wilderness with sisu. In addition to the constant stream of images being uploaded and comments made on Facebook, increasing amounts of user generated content started appearing on video sharing sites such as YouTube and Bambuser. Here's one particularly funny video from yet another weird and wonderful pit stop. It's worth watching till the last couple minutes to see some more odd stuff unfolding...only in Finland! 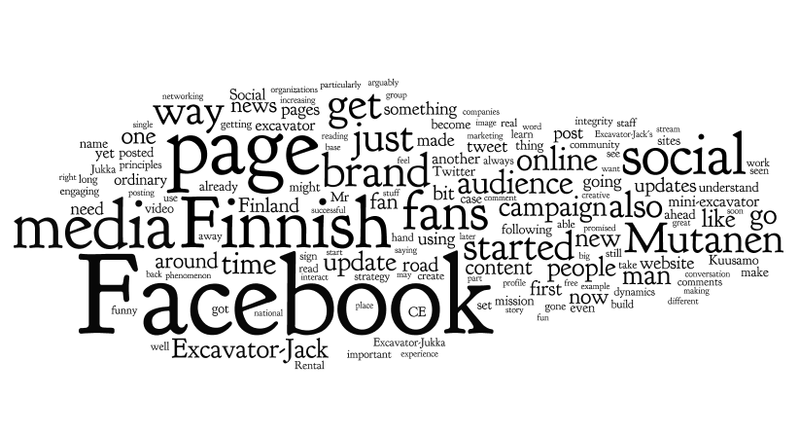 On the penultimate day of the adventurous yet arguably slow journey, Facebook was about to commit suicide in its Nordic market by taking down, with no explanation or need whatsoever, the extremely popular Excavator-Jack's fan page. This caused a huge outrage in the Finnish online community with angry bloggers and mainstream Finnish media outlets reacting in disgust. Apparently reactions were heard all the way over at the Facebook-headquarters in San Francisco as the page was recovered later in the afternoon. Qinghua He, the Chinese excavator manufacturer's big boss greets Mutanen amidst his adoring fans. 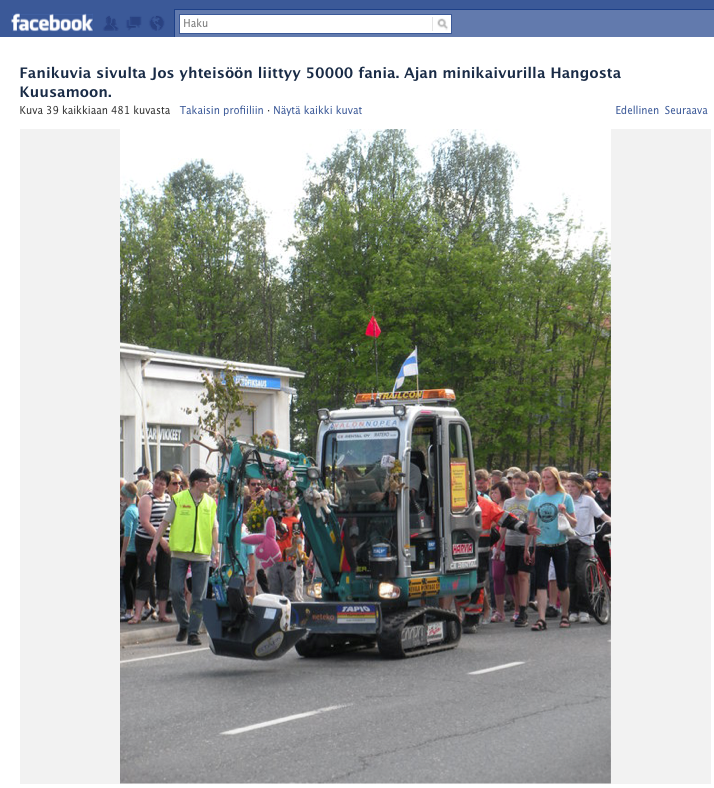 Finnish media covered the whole event scrupulously. 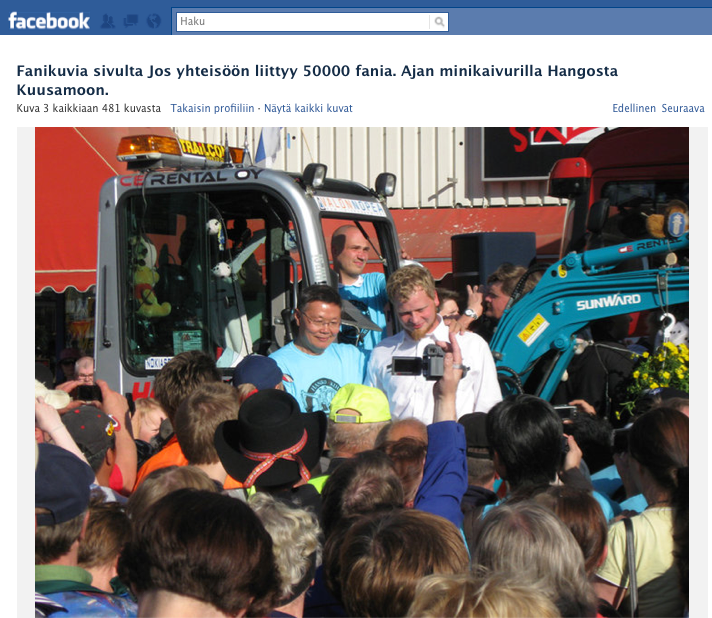 Helsingin Sanomat, Finland's biggest newspaper, reported how 5000 fans, including the Santa, welcomed the Excavator-Jack at the main square of Kuusamo 'like a Prime Minister'. In a video posted by Iltasanomat, Mutanen can be seen giving a typically brief and modest Finnish speech to his thousands of fans: "I'm no American so I don't really know how to ramble on as they do over there, but would like to just say thanks." As the old Finnish proverb indeed goes: "Speech is silver, silence is gold." Meanwhile YLE, the Finnish equivalent of BBC, broadcasted a 30 minute documentary entitled 'Mutanen became a phenomenon' featuring the best of the 27 day trip. Tuomo Hänninen, A Finnish Member of Parliament, took time away from important negotiations on nuclear energy to fly over to Kuusamo to deliver greetings from the new Prime Minister Mari Kiviniemi herself — and to make some particularly funny remarks of his own as reported by Helsingin Sanomat. Praising the efforts of the ordinary Finnish man with an ordinary Finnish name, who had inspired the nation of Finland in an unprecedented way, Hänninen fumed that 'Finland would do a lot better as a country if the Finns would get in touch with their inner Mutanen' and turned then all nostalgic: "This reminds me of the scenes from 1995 when Finland won the ice hockey world championship." Despite being an avid blogger, the MP admitted he had been a Facebook-skeptic until now but promised that he would now definitely be joining the fast-growing social networking site inspired by the example set by the Excavator-Jack: "I have previously down played Facebook, but now even I shall sign up for the service" (as of the 2nd of July, the MP has yet to be spotted on Facebook). Dinner parties were thrown, speeches were made and songs were sang. Probably statues are being erected as we speak. Excavator-Jack had become a phenomenon and a national hero. More Facebook pages were once again created in appreciation of the man: 'Excavator TV-addicts' was born as was 'Thank you Excavator-Jack', just to name a couple. 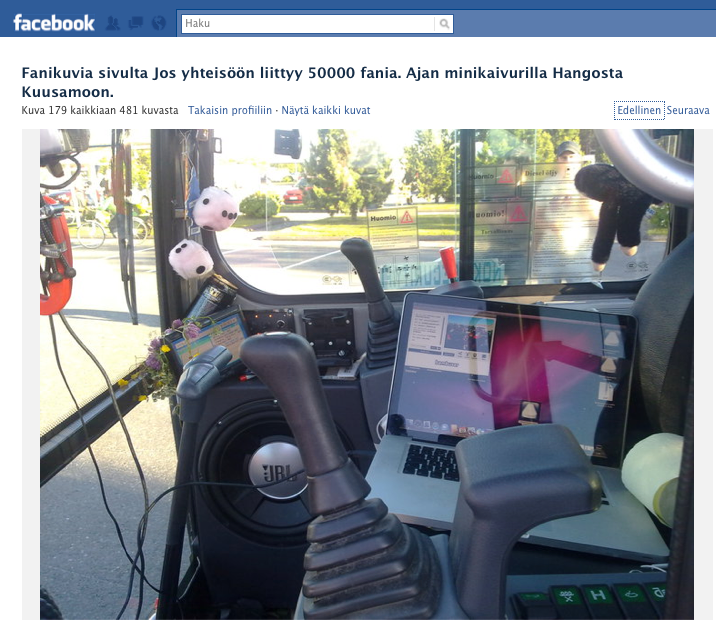 Within 20 minutes of posting an update on Facebook, the Excavator-Jukka was able to attract 1 029 'likings' and nearly 100 comments to a recent update after his trip. Watch this space, Barack Obama. Translation of the update: "On my way back home. Speed of the car is making my head spin :) Feeling blue but happy at the same time. All round a successful trip." Bloggers are already speculating on the different ways in which the man could capitalize on his astounding personal following he has single handedly managed to build. This particular blogger argued that Mutanen ought to get into politics as he would easily go through in the next Finnish parliamentary elections: "Mutanen is a man of his word who doesn't hassle about. He has 100 000+ Facebook fans with a large off-line following too. He wouldn't need to invest a single penny in his campaign. And Mutanen also happens to have excellent connections to the lucrative Chinese market." Unlike most of us who make promises only to later forget about them, Mr. Mutanen certainly has arguably built a degree of political capital by simply displaying the usual Finnish characteristics of modesty combined with high integrity, sisu and dry but witty humor. Well, that was the fun bit. Let's get down to earth now and think about some lessons we could learn from the Excavator-Jack's hilarious yet brilliant social media campaign. Here's a start. I picked this headline from a Mashable article recently published which I though was arguably the biggest lesson you can draw from the Excavator-Jack's campaign. It's not just about the online user experience, although that's obviously important too to get right. For creating a truly clever and successful new media campaign, you'll need to combine the social media experience with an equally engaging social experience in the physical context that can go viral off-line too. While technological breakthroughs are enabling us to do more stuff online, the natural need people have for physical experiences won't go away. Ability to communicate over the web hasn't, for example, decreased business traveling, as was widely believed; instead it actually increased it as at some stage you'll want to meet the person with whom you've established a virtual relationship. I'm not saying that every single person online should have the chance to interact with your social media stunt physically — but it certainly helps to engage your audience if a part of your audience is able to do so. A big part of the attraction around the Excavator-Jack was how the online community could witness, through the stream of content uploaded on Facebook by other fans, how people were interacting with the man and his mini-excavator on the road. This was only to contribute to creating the snow ball effect. It seems that online communities get their act together if something worthwhile and concrete could happen as a result. So you may considering making a promise that you would do something funny if so and so many people sign up. While humor seems to be something that certainly engages online communities, I'd like to see the same if -theory being used for e.g. cause-related marketing; say you'll do something worthwhile if so and so many people sign up. A clever way of developing a following long before the possible concrete action would take place. Word of warning: only works if you're a man or a woman of your word. High integrity required. Simplistic yet functional online presence combined with one simple creative idea was all that Excavator-Jukka did to build his huge following. It's not merely about using Facebook or one of the other social networking sites. The real issue is to try to understand the fast evolving dynamics of the new media. Join in the conversation in case you have yet to do so. The important thing then to consider is where your target audience is too and how to attract it. Get to grips with the dynamics of your chosen online network as each has its own little tricks of the trade you should be aware of. If it's Facebook, I recommend reading my 8 tips for getting started on Facebook. If Twitter is the site your target audience is using, read my 10 principles for getting started on Twitter. In life one can pretend to be someone their not and yes, anyone can be a dog on the web too. That can work for a while, but is that the way to be successful on or offline? Is that the way to establish trust and create a real following? It may work for a while, but establishing trust under false pretenses can be a risky strategy not only in terms of your social media strategy but also your business reputation. Mind you, it's arguably unethical too. I'd like to paraphrase one of Jose Mourinho's many insightful comments at one of his famous post-match press conferences: "Truth is like olive oil — it always pops up." Jukka Mutanen was just being himself, an ordinary Finnish guy with an ordinary Finnish surname. Nothing more, nothing less. He ultimately let his actions speak for themselves and earned Finland's respect as a result. I monitored the nature of the discourse closely and I'd say 99 per cent of all comments were positive and supportive of his mission, which is outstanding having studied how online forums easily turn sour after a while. In the age of financial crisis, the Enrons and the Maddoffs, the world could learn a thing or to of the high integrity displayed by the Excavator-Jack. So, do you agree with these five lessons I've taken? If not why not? What would you conclude? Feel free to post a comment and lets have a conversation. If you've spotted some other interesting snippets of information around this Finnish social media phenomenon which I've missed here, please do also share. I'm currently a digital researcher @RadleyYeldar keeping a close eye on #socialmedia developments. Follow my tweets @finntastico.